What a great old time daguerreotype! Now if only they smiled. The faces are so real and clear. If I study the faces for a while, I know they aren't smiling but maybe it's in the eyes or the way they lean into one another....I don't know. But they look like they very much enjoy each others company. 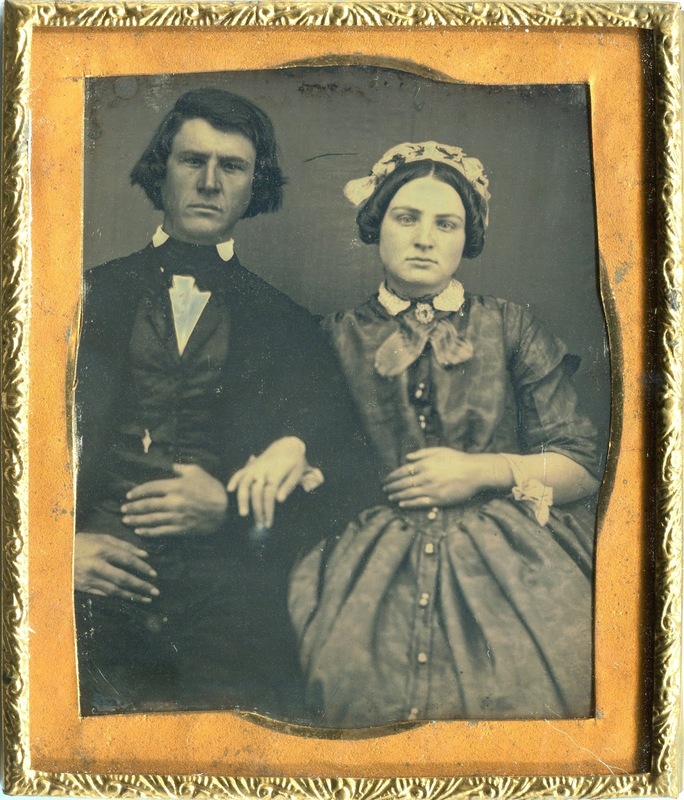 I agree, they look at ease and the way her right* hand is touching his right* arm is sweet (*daguerreotypes are mirror images unlike today's photos). Do you know who they are? They look fairly well off, he has a nice watch fob and she has several pieces of jewelry, but no wedding bands. The clothes look nice without being ultra fashionable, maybe their "Sunday best"? They do look comfortable with each other, close together, but people didn't smile in those kind of old pictures because they had to hold their pose for awhile. He looks like someone who had an outdoor job, possibly a farmer, because he has obviously had a hat on and his face looks weathered. What I can tell of his hands they don't look like a stone or woodworker's hands, not beat up enough, and his hair isn't as short as you would expect of someone who has the time to go to a barber. What do you think? Thank you for your close examination! I like what she is wearing at her hair (I don't know how to call it) and his cravat (I'm not a fan of ties). Her dress is not particularly fancyfull and she doesn't show as much jewelry as others do, so I guess they are not rich. He could be a farmer indeed, or the owner of a small business. His hairdo does not tell me much since I've seen the weirdest male hairstyles at these kind of pictures :-). Well, I hope they were a happy couple, but their faces certainly don’t show it. Photos were relatively scarce (so totally unlike today), so people took this very seriously. And the long exposure time did not help either.